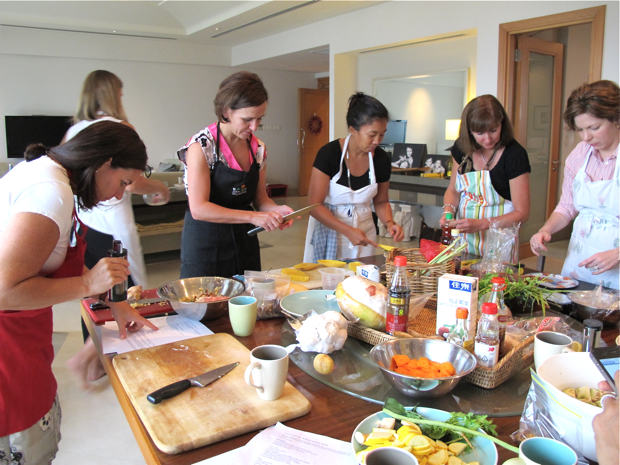 Every year, I donate a cooking class to The Singapore American School to raise money for the school’s scholarships, projects and library enhancement. Two lovely parents were kind enough to sign up for my class through a silent auction and gathered their friends together to prepare an Asian meal with me. The hosts selected a menu of their favorite Southeast Asian dishes: Thai Pomelo, Shrimp Salad, Vietnamese Caramelized Chicken Wings and Thai Sticky Rice with Mangoes and Coconut Cream. All twelve of us were anxious to start cooking and sit down to a sumptuous family style meal together. 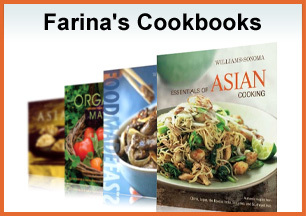 We started the morning by sharing school stories about our children and moved into topics of how to create a well-stocked Asian pantry, including debating about what we felt are the best soy and fish sauces to use in Chinese and Southeast Asian cooking. In no time, the kitchen was filled with delicious aromas accompanied by the sound of knives chopping away. 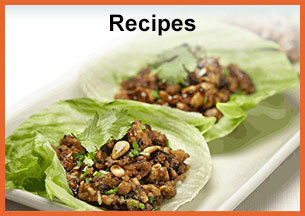 While cooking, the question of timing and ingredient substitution for my recipes came up. I shared the importance of using the freshest ingredients available and, most importantly, of experimenting and not being intimidated by the unfamiliar. 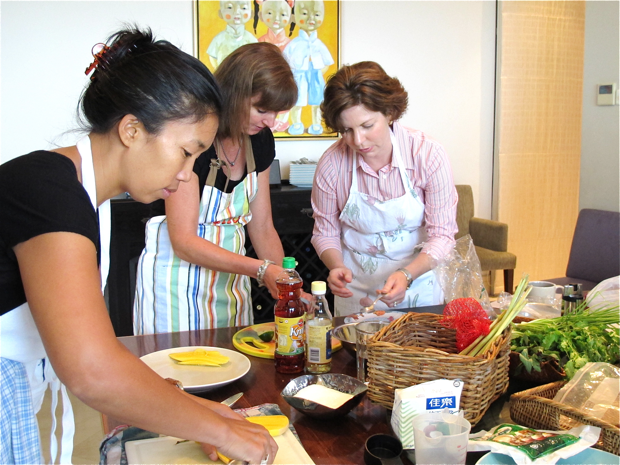 The kitchen was buzzing with activity while chicken braised in the oven, dumplings steamed in a pan, and the group of ladies peeled pomelo and made vinaigrette for a shrimp salad. 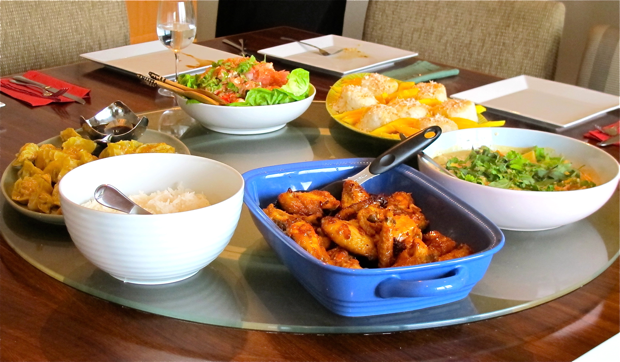 Within 2 hours, we had a beautiful spread of fragrant, colorful dishes ready to be devoured. 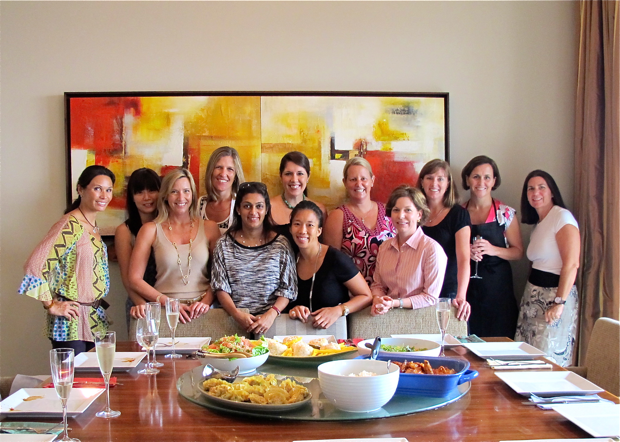 In the ideal world, we would have 11 competent home chefs at home prepping and cooking every meal together; but at least our group walked away with new recipes to add to their repertoire and a few cooking tips to help make cooking Asian less daunting. 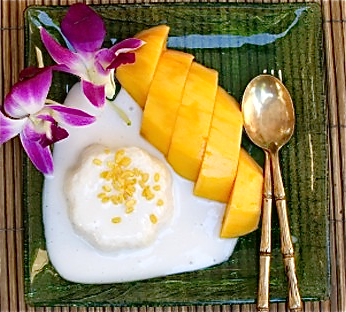 Meantime, I hope you enjoy one of the favorite recipes from our party – the Thai Sticky Rice with Mangoes. Rinse the rice under cold water until water runs clear. Place rinsed rice in a large bowl with enough cold water to cover and soak for one hour. While the rice soaks, combine the ingredients for the rice seasoning in a small sauce pan. Bring to a simmer over low heat and stir until the sugar dissolves, 2 to 3 minutes. Set aside. For the coconut sauce, combine the coconut cream and palm sugar in a small sauce pan and bring to a simmer over low heat. Stir the sauce until the palm sugar dissolves, 2 to 3 minutes. Set aside. Use a pot with a steamer tray insert lined with wet cheesecloth. Drain the rice and transfer it to the steamer tray, distributing the rice evenly. Cover and steam for 20 minutes, remove from heat and keep covered for 10 minutes. Line 4 to 6 (4 oz.) ramekins with 8 inch squares of plastic wrap. Once the rice is cooked, transfer the rice to a large bowl and gradually pour the rice seasoning into the rice while gently mixing with a spatula. Mix until all the seasoning is absorbed by the rice. Spoon 1/4 cup of the sticky rice into each ramekin, pressing down to evenly distribute the rice. Cover the rice with the overlapping plastic wrap and let rest at room temperature for at least a half hour or up to 3 hours. Do not refrigerate the rice or the rice will become hard. 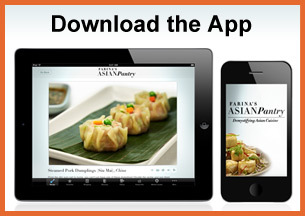 To serve, invert each ramekin of sticky rice onto separate plates. Use a fork to poke several holes into the tops of each mound of rice and drizzle the coconut sauce over the top. Garnish the rice with sliced mangoes and sprinkle toasted coconut on top. Serve at room temperature.